Description - Easy to install and remove, our Gym Floor Cover Tiles are the perfect solution to protect gym floors during large special events. Constructed with polypropylene fibers, these large carpet tiles are very durable and can be easily cleaned making protecting your gym floor a breeze. Providing you with a more finished look, these tiles are backed by a 3 year warranty and are certain to not mark your floor. Material - 100% Polypropylene with a Polyolefin Plus backing. Size - 39.375" x 78.75"
Weight - Approximately 14 Lbs. per tile. Recommended Uses – Gym Floor Cover Tiles are great for protecting gym floors during special events and have been used as flooring for banquets, graduations, concerts, proms, at colleges, for fundraisers, in high school gymnasiums, in public arenas and anywhere a protective floor covering is desired. Floor cover tiles do not require special equipment or cleaning products. To keep your these tiles clean and inviting, they should be vacuumed frequently. Can be easily installed by one person. Lay flat and do not slide. Will not mark gym floors. Can you tell me how much weight the Gym Floor Cover Tiles can withstand? We have a portable stage and need to make sure the floor protector can handle it. Thanks! 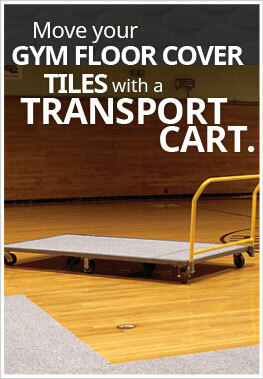 Our Gym Floor Cover Tiles can handle the weight of a portable stage on top of them. Our Gym Floor Cover Tiles are not tested for maximum weight they can hold, but are very durable and are used for events of all sizes. Do you have to place carpet down before or can it be installed over any surface? You can install our Gym Floor Cover Tiles over any hard, flat surface. Nothing needs to be placed underneath it. If you were concerned that liquids might fall between the seams, you could place a plastic film under the tiles. It worked great for our church. We have artists coming in for concerts with a lot of gear. This protects our floor from getting damaged.